According to the EPA, ever person can generate up to 4 pounds of garbage a day. If you were to hold onto that garbage for a year, that would mean a haul of 1,460 pounds of trash. Unless you’re a hoarding, you’re not going to have that much garbage. However, that doesn’t mean you won’t need to occasionally get rid of some bulky items. These would be all the things that can’t fit into your garbage can like sofas, chairs, appliances and construction waste. To get rid of that kind of rubbish you’ll either need to rent a dumpster or hire professionals for a junk pick up. Which is the better option? In terms of the dumpster rental, you’ll have to contend with several restrictions. First, if you’re renting a larger container that will need to be placed on the street, then you’ll have to get a proper permit from the city. You’ll also have to block off at least 60 feet of clearance. That could include some of your neighbor’s parking. 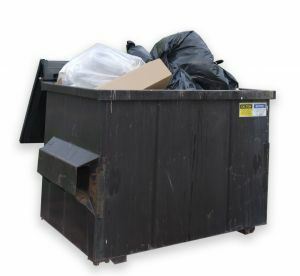 A dumpster rental requires a minimum term of three days. Most dumpster loads are weighed to determine the dumping fee. There could be a weight restriction with the particular company you choose for the rental. On the positive side, dumpsters can hold huge amounts of rubbish. Once loaded, the dumpsters will be retrieved and driven to the nearest landfill. You won’t have to worry about any of that garbage ever again. With regard to professional junk pick up companies, Junk King has earned high marks for customer satisfaction. Junk King provides a truck big enough to hold whatever you’re throwing out and a strong work crew. You won’t have to lift any of the heavy objects. Instead, the two-man Junk King team will pick up your junk from its current position and get it to the back of the truck. That includes going up and down stairs. Junk King can remove all of your rubbish in a single trip and there are no weight restrictions. You’ll be charged a flat fee based on the volume of your rubbish as it will fit on the back of the truck. You can even schedule a same day appointment that will have your junk removed fast. When you add up all the pros and cons, it’s clear to see that a junk pick up appointment with Junk King is the only way to go for proper clutter removal. This entry was posted in Dumpster Rentals vs. Junk Pick Up In Denver and tagged Dumpster Rentals vs. Junk Pick Up In Denver, Junk King, junk pick up on April 29, 2014 by Paul Durant. Last updated August 1, 2017 . One of the simplest ways you can celebrate Earth Day is to turn off your lights. To demonstrate that point, Denver International Airport will be switching off several sets of lights throughout the facility. Don’t worry; the runway lights will be kept on! Instead, what will be flipped off for an hour will be the DIA sign on Pena Boulevard, the sign marking Jeppesen Terminal and the lights that show off the airport’s Mustang Statue. Kim Day, Kim Day, Denver’s manager of aviation, explains the reasons behind the blackout: “Earth Hour is an international day of education and a call to action with regard to our responsibility and the impact of our actions on our planet. We at Denver International Airport are trying to reduce our carbon footprint and help our traveling public know how they can do the same,” Day adds. According to those in the know, turning on lights takes up 34% of all the electricity used in the country. You can save on your home power bills if you switch off those lights when you leave the room. Another proactive step you can take to celebrate Earth Day is to hire Junk King for a green junk removal appointment. This junk removal session with Junk King will have your home cleared of clutter in no time. When the Junk King crew rolls up at the scheduled time, they’ll get to work removing all those oversized objects you want to toss out. That list can include things like tires, sofas, chairs, mattresses, lumber scraps, appliances and boxes of junk. Before Junk King set up business in Dallas, you only option for junk removal was to do it yourself or hire a day-laborer type to do the job. There is no guarantee your junk wouldn’t end up at an illegal site. With Junk King, you are guaranteed that all your junk will be disposed of in a 100% responsible manner. Often this will mean dropping off your items to a recycling center. That’s when those pieces can be recycled, repurposed and reused. Junk King might also opt to drop your stuff off at a local charity. Many of those organizations can work wonders with an old sofa or washing machine. In no time, your unwanted stuff can make someone’s life a bit better. If you want dependable and eco-friendly junk removal then Junk King is the only way to go. This entry was posted in Uncategorized and tagged Celebrate Earth Day In Denver With Green Junk Removal on April 18, 2014 by Paul Durant. Last updated August 1, 2017 .